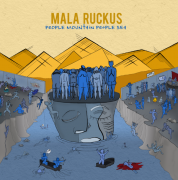 Mala Ruckus’ People Mountain People Sea is sure to be your go-to summer album | Rrampt. We’ve had many interactions with bands and musicians over the years, and they all have interesting backgrounds and stories to tell, but when we talked to Mala Ruckus about their formation, we knew we there was something unique to their story. And then when we heard an advanced copy of their upcoming album, People Mountain People Sea due out May 25, we knew there was something unique to their sound, as well. First, their story: Alex, Ian, Francis, Caolon, and Sean all met in China while teaching English. Collectively the represent Canada, America, Ireland, and England and each brings diverse influences to the group. “We formed in China (all expats from different parts of the world) and played lots of shows until we were arrested during a show. It was a crazy experience,” Alex Montyro tells us. After spending a day in jail, they were told the arrest was due to performing without a license. Under threats of further state punishment, they decided to relocate and ended up in Prague (lucky guys – one of my favourite cities). Drinking game? Prayer to the music gods? Now their sound: They might have been arrested in China, but it’s you who will be arrested by their exuberant vibe (sorry couldn’t resist). 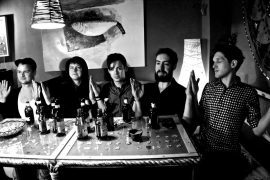 They call themselves indie-folk-rock, but with a synthesizer, mandolin, and ska-like sensibility in their songwriting, they bring a much more nuanced sound. Think Langhorne Slim meets Sublime meets 90s pop meets jazz fusion. It’s honestly one of the funnest albums we’ve listened to here at Rrampt, and perfect for summer grooving. The album kicks off with Run, a ska-inspired burner about taking to the open road to escape the pain of life and the lyrics will grip you from start to finish. Hoverboard is a fast-paced thought experiment on all the possible lives we could have lived: “I should have been born in the 40‘s /Telling revolutionary stories /passin’ hats in Greenwich bars /swapping songs and comparing scars” Montyro spouts masterfully. Hoverboard is the band’s daydream, but Sheets will inspire you to lie on the grass and daydream yourself with its infectious groove and honeyed vocals. East Hastings is a shift in tone with an high-energy chorus that will pick you up off the grass and get you moving again. The standout B-side song is definitely Beast of Our Babylon, their first single, which is available on Youtube and Spotify. It’s a delicate folk song with a strong message. “I’ve got ideas that could shape this world,” Montyro croons. Well, they’ve clearly shown they’re full of ideas by the time the album comes to a close, and when you reflect on the collection of songs they’ve put forward for this first full-length album, you’ll want to sit and have a beer with these guys to hear about their adventures and arrests (just one, actually). And you’ll want to see them live. But you’ll have to fly to Prague to do it, unless they come to Canada to tour. We’ll have to promise them we won’t arrest them, though. To keep up with their music and tour plans, you can follow them here. We suggest you do so.